It is that time when you hustle and bustle to prepare for the new school year. Whether you need bags, books, pens or any other stationery items, come check out Innovative Superstore! You'll be pleasantly surprised at the variety of school supplies that we stock. Come take advantage of our Back to School Sale starting from August 16; get first choice of our awesome stationery items and save up to 25%! Show your support for COPA America with the purchase of the sticker album and stickers! Complete the album by June 30th and win an Official COPA America Centenario Football!! Because Awesome Dads, Deserve Awesome Stuff !! All Dads are different. They can be Grumpy, Fun, Strict, Football lovers, Golf lovers, Dependable, Miserable, but they all have one thing in common. They are all AWESOME DADS and they deserve an awesome gift. Already have speakers but missing wireless? Well we have just the thing! Why buy a whole new set of speakers when you can use ZoundKast to turn your stereo into a bluetooth system without hurting the pocket. All you need is 3.5mm audio jack output or RCA connections. Are you using the right pencil for your CSEC and CAPE Exams?! Did you know that CSEC and CAPE requires you to use 3B pencils? Don't flunk out because you used the wrong pencil. Get yours today at Innovative Superstore! Celebrate First communion with Perfect Presents! First communion is coming quick! And we have Perfect Presents for your soon-to-be graduate! From notebooks to rosaries, and assorted jewellery, you're bound to find something. Too Many Devices? Can't type quick enough? Let us help your efficiency tun up!! With the Logitech Bluetooth Multi-Device Keyboard, you can type on your Computer, Tablet and Smartphone! Just turn the dial to switch between devices. Windows or Mac? Android or Iphone? Doesn't matter. We love our Teachers...Don't you ? Mother's day is approaching! Don't Blow it! Mother's Day is May 8th. Start shopping for the perfect present at Innovative Superstore! 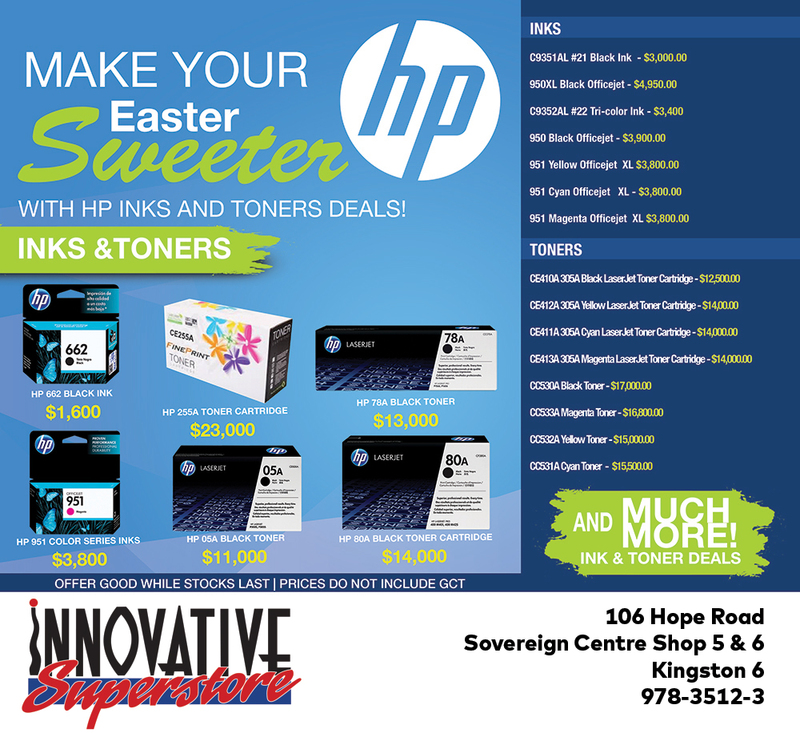 Make your Easter Sweeter with HP Ink & Toner Deals! Reduced prices on selected Inks and Toners. See info below. Music to your ears! Wherever, Whenever. With over 30+ selection of speakers, you're bound to find something to soothe the ears! From home theatre to floatable bluetooth, waterproof and sandproof speakers—we offer a speaker to fit any occasion. With speakers that tie, clip and even stick in the shower, you never have to be away from the sounds you love! Browse our entire speaker collection on our products page. Can the Altec Lansing Life Jacket Bluetooth Speaker withstand veteran Paul Murray with professional explosives squad Tripwire Operations Group using Thermite, a Fireball, and a 300 Blackout? Bring it on. Get yours today at Innovative Superstore! Freeze a moment in time for Valentines Day! Surprise your lover with a frozen moment in time! Orders take 5 business days. Call 876-978-3512/3 and speak to Malika for further information! Hello and welcome to the new Innovative Superstore Website! We will be adding products to the website shortly, so subscribe for updates and special discounts by clicking here or using the navigation bar provided at the top. You can check back here to be informed of any promotions, specials and new products. Feel free to contact us using the link placed on the lower navigation bar. We'd love to hear from you!